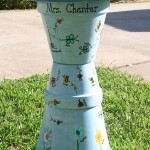 For my 2nd grader’s class project for the school’s annual fundraising gala, I made a beautiful birdbath from terra cotta pots. 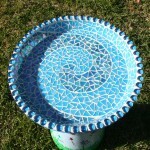 The top is a large saucer featuring a mosaic wave pattern with 2 colors of glass and glass marbles around edge. 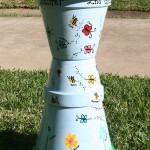 I turned the kids’ thumbprints into flowers, lady bugs, bees, butterflies, dragonflies, crickets and caterpillars. All the kids’ names are next to their thumbprints. 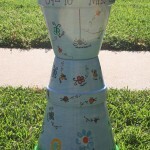 It took me many hours to finish, but it brought in over $200 for the school. Click on the images to get a better view. 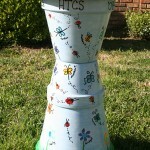 This entry was posted in Home Accessories and tagged bird bath, mosaic, terra cotta pot, thumbprints by ckcringo. Bookmark the permalink. Love this! Do you by chance have information for supplies for this? Maybe type of glue used? 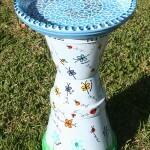 I’m chairing an auction for my kids’ school & we’re looking for class project ideas. I’m assumming that you used paint for clay pots? Any tips would be so appreciated! Hi Candice! I used Weld-Bond to seal the pots (layers and layers of watered-down Weld-Bond), painted the whole thing white with an outdoor latex primer (which left it a little sticky), so I painted over that with a couple of coats of Gesso. The color was all done with normal ol’ craft paints, followed by many coats of outdoor varnish. I used Weld-Bond to glue on the mosaic tiles (but if I did it again, I’d use tile mortar for more durability). 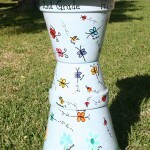 The three pots are held together by a long threaded rod with metal fender washers and rubber washers (for cushion) and nuts. The whole thing breaks down for transport or storage.The saucer simply sits on the top pot. I put some little rubber bumpers on the bottom of the saucer that fit just inside of the top pot for extra stability. I’ve also done a matching gazing ball and stand. Eventually, I’ll get pictures of that up here too. Copyright © 2011 Casey Ringo. All rights reserved.